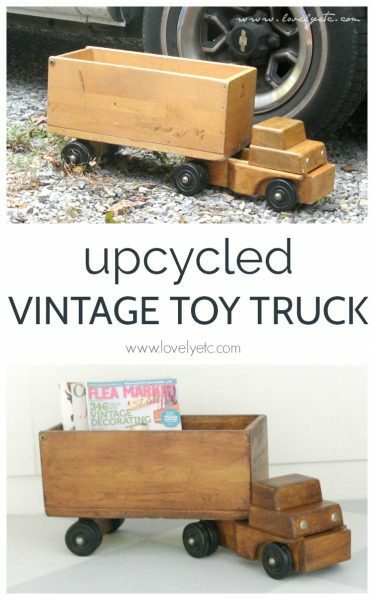 Unique idea for upcycling an old toy truck - Lovely Etc. There is something I absolutely love about vintage toys. They don’t light up and make crazy noises and they’re made of things like wood and metal instead of cheap plastic. 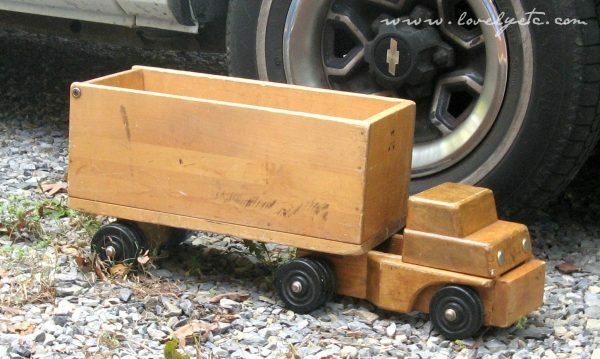 And even better, simple vintage toys can be so fun to repurpose! I found this awesome old wooden truck last week at a church yard sale. It is big – around two feet long – and very sturdy. There was something about it that I absolutely loved so I snapped it up. It was pretty banged up from lots of years of use and at first I was planning to paint it a nice bright color. But the thing I really love about it is that it is made of wood, not plastic like other toys. And I didn’t want to cover that up. So I decided to really embrace the wood and stain it instead. I sanded off the old finish first. Since this is fairly small, I sanded it by hand but you could always use a palm sander for the flat parts to speed things up. I started with 100 grit sandpaper and then went over it again with 150 grit. It was a bit of a pain getting in all the little corners of the inside of the truck bed, but all in all the sanding went pretty quickly. Then I used an old rag to stain the whole thing with dark walnut stain followed by a few coats of wipe-on poly to seal it. I absolutely love how it turned out. It would be still be a fantastic toy truck for a little girl or boy to play with, but I think it could be used all kinds of ways now. I could see it in a bathroom holding extra towels and toilet paper. Or on a porch planted with flowers. I chose to use it as a cute magazine holder. What do you think? 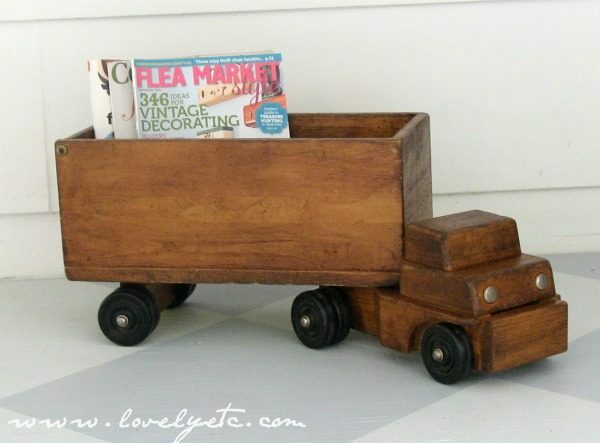 Anyone else going to be adding wooden trucks to their thrifting list from now on? Now that is an amazing find! Love it. Absolutely could be used in an adult room. Love the idea of it being used as a magazine rack in a man’s den or a family room. Love that you left it stained wood instead of painting it. Awesome job and creativity. I love that you left it natural wood color. It really is a great find!! It’s awesome and I would never be able to part with it either! What a nice gift to give! I might use this cool truck as a planter- it would overflow with flowers. Wow, what a rare find!! Such a cool piece, you’re gonna be so popular when it’s opened on his birthday!! What an amazing find. I think I’d find it hard to part with it! wow. this is so cool. you have “the eye” as some people say. i think i will for sure be pinning this to my DIY board…. just in case i every come across something like this! i think staining it was the BEST idea! i can totally see it in an adult space. for sure. I love it for magazines. How great it would be in a bathroom too with towels! Thanks for linking up at Beyond the Picket Fence. I too love love love wooden toys. I preffer them to the plastic ones. This truck is darling. Also for grown ups I think. I can definitely see it in an adult space. Nice call staining instead of painting. Love the truck and your choice to stain rather than paint. Definitely something that could be used in an adult space as well. Awesome! I love it and think it’s an awesome find!! I can see it in an office holding magazines or to file stuff!! Love the personal touch you added!! I love this truck. I’m a preschool teacher and we used to have them in my classroom… wonder where they are now? ?? Yes! I bought this one from a preschool sale – I would love to find more!